Learn how electric vehicle (EV) charging can work for town and city homes without driveways. Clever simple #cleantech! 2017/07/11 I had the good fortune to be at a cleantech pitching session beside Knut, founder of ubitricity. I'm a huge fan of part of his plan to take over the world. The part that happens to make owning a small electric car (an EV) more realistic for me. I have never owned a car. I do sometimes drive. (Likely more miles outside the UK than in it!) Our upmarket conveyancer was horrified that "we had no guaranteed parking" for our new house. To which I replied that "I don't have a car" to his discomfort. The ubitricity scheme provides a smart charging cable for your car. The cable contains an Internet-connected meter. The cable connects you to power in the lamp post. It also connects to an appropriate domestic tariff. Just as if you were carrying around your home electricity meter with you. But without the rather long extension cable! You are billed as your mobile phone is, for usage, wherever you are. Your home electricity supply meter comes with an identifier called an MPAN (Meter Point Administration Number). An MPAN normally implies a fixed location and building. The ubitricity MPANs are mobile. Street lights typically draw 100W. But the wiring and supply to them can handle many kilowatts. Enough to provide a decent charge. Faster than from a domestic 13A socket in fact, even if not a super-fast one. Plan to plug in overnight on your street. Or for a top-up while visiting shops or even at work. You'll be sorted. The charging cables are locked at both ends, thus hard to steal. Now ubitricity can convert any London lamp post to a charging point in a matter of minutes. Magic! All obvious in hindsight. As any really good idea is likely to be. 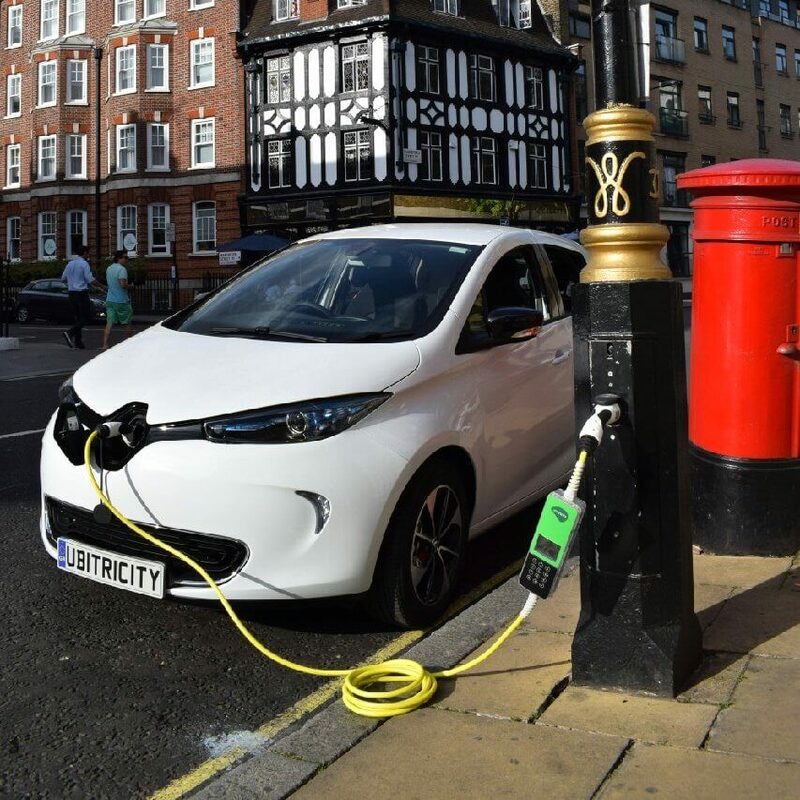 2018/04/04: PG&E to test price signals, load management strategies in EV charging program: With non-ubitricity-style models such as PG&E's "... the majority of the cost in building charging stations comes from trenching and the conduit from power to vehicle ..."
2018/03/06: Germany plans to convert 12,000 distribution substations for electric car charging. 2017/11/14: With an investment in ubitricity Siemens opts for innovative solutions for electromobility. 2017/07/20: LED streetlamp conversions enable electric car charging, too. 2017/07/20: Not Everyone Has A Garage, But What If The Streetlights Were Electric Car Charging Stations? "The charging cables are also designed to work both ways: in the future, cars could help store energy and feed power back into the grid as it’s needed." "Electric mobility as a one-stop shop": ubitricity. Royal Borough of Kensington and Chelsea leads the charge on electric cars. 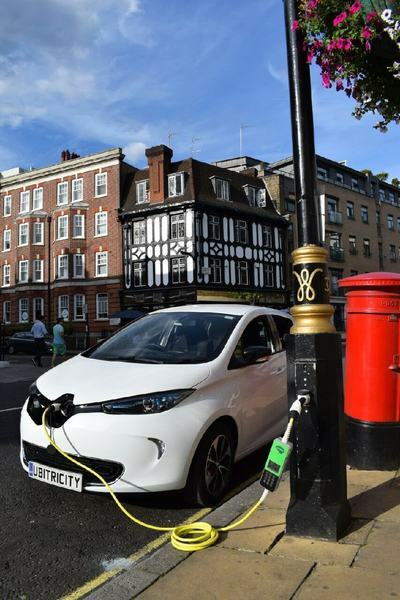 London street lamps are being turned into electric car charging points. London Borough of Hounslow: Electric vehicles and charging points: "In order to overcome some of the potential barriers to purchase, the council is fitting electric vehicle charging points into streetlights as part of a three-year TfL funded trial, allowing residents to directly charge their car from lamp columns located on the kerb side. The charge points are part of a trial which we are undertaking to see if having an oversupply of charge points ensures that owners always have somewhere they can charge, but without increasing parking pressure for other residents." Overview of early electric cars (1895-1925): "One hundred years ago electric cars were a common sight on city streets in Europe and the United States. Many of them had a range comparable to that of today's EVs." Car being charged at London lamp post with red pillarbox in shot! C/o ubitricity. First published 2017-07-12 , updated 2019-04-22 . Site copyright © 2007-2019 Damon Hart-Davis. Hosted by ExNet.